The best collection of bowling related images and graphics. CDE Software introduces a new graphics package on DVD-ROM format. We’ve created The Ultimate Bowling Clipart Library DVD, bringing new bowling themed graphics, photos and images along with incorporating remastered versions of our previous clipart collections, Incredible Bowling Art Library, The Art of Bowling and Totally Bowling. We’ve added some new variations and styles. States – Bowling themed logos for each US state and Canadian province. This product is not available for download. 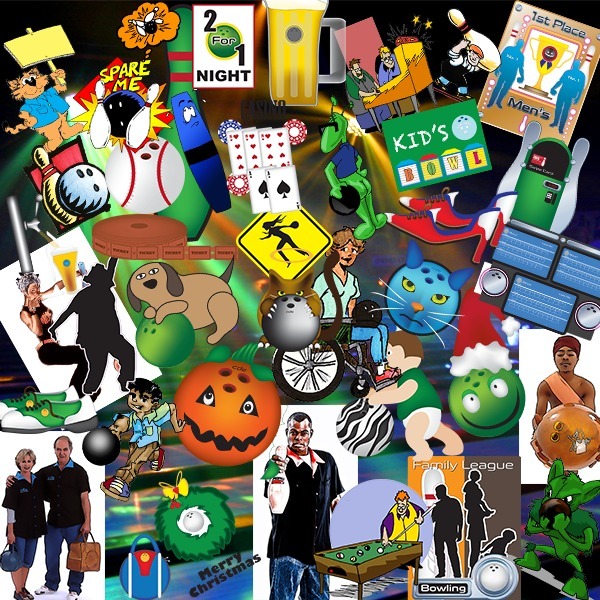 DOES THE ULTIMATE BOWLING CLIPART LIBRARY COME WITH AN INSTALLER OR PROGRAM TO USE THE CLIPART? No. Like our previous clipart collections and other clipart collections that are produced, what you are receiving is just the images. You will need to use a tool, such as BLS, BTM, Microsoft Word, Microsoft Publisher, Paint, Photoshop, Corel Draw or other desktop publishing software, free or commercial, to use the images. CAN I MAKE AND EITHER GIVE AWAY OR SELL PRODUCTS USING IMAGES FROM THIS COLLECTION? If you wish to use an image from this collection as part of manufacturing of merchandise, either promotional or for sale, you must contact CDE Software to receive explicit written permission first. WHAT IS THE RETURN POLICY, IF I DON'T CARE FOR THIS COLLECTION? We certainly hope you enjoy this collection. Like any clipart collection, there may be a few images that may not appeal to you, but we strived to come up with a lot of graphics, images and photos of various subjects and designs in hope that everyone can find a lot of things that appeal to them. We do provide a PDF index of the images to look at prior to purchase. The DVD or USB Flash Drive will also be accompanied by a full color index. Take a look at these prior to purchase or prior to opening the shrinkwrap from the DVD or USB Flash Drive. Once the shrinkwrap is removed, the purchase is not eligible for return or refund.